In November, Intel announced its Compute Stick—an entire PC inside the form factor of a Google Chromecast. Now it's ready to ship, and at just $149 for the Windows version. Intel quietly announced at the Consumer Electronics Show here that the Compute Stick would ship in March. Two versions will be available: the Windows (with Bing) version, for $149, as well as a lower-powered Linux version for $89. The stick will plug into the back of a smart TV or monitor “and bring intelligence to that,” said Kirk Skaugen, senior vice president and general manager of the PC Client Group at Intel, during the Intel investor conference in Santa Clara, California, which was webcast. The concept isn't new, of course. 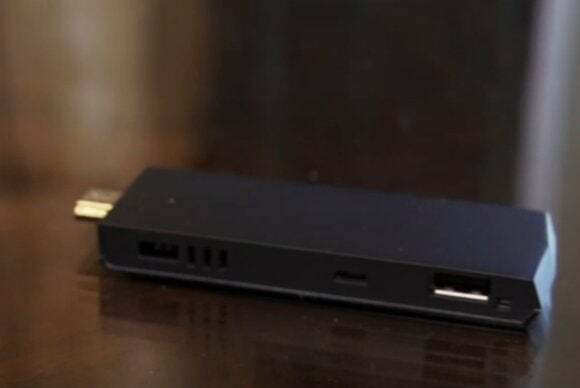 Amazon, Google, and others have dedicated streaming boxes squezed into the HDMI stick form factor, and Dell’s $129.99 Wyse Cloud Connect can turn a screen or display into a PC, gaming machine or streaming media player. First there was the desktop PC, then the laptop, the tablet, Intel's NUC, then modular computers like Amplicity, and now this. Computing just keeps getting smaller and smaller. Why this matters: You probably won't replace your PC with Intel's Compute Stick. But with the prevalence of cloud computing, the Stick might turn out to be the tool IT managers drop in their bag when they hit the road. Unfortunately, however, hotel TVs seem to have an uncanny lack of open HDMI ports when you need them. Could you play Peggle on this? World of Warcraft? We'd be interested to find out.